My first impression of Moscow was one of denial. Barring a few banners and signs, the city seemed to be unaware that it was hosting a tournament of the World Cup’s magnitude. Stony-faced commuters seemed to be avoiding tourists, almost as if the Russian public were inconvenienced by this sudden influx of foreigners. In fact, some locals are going on month-long holidays to avoid the expected one-million plus tourists. The festive mood is restricted to certain areas like the metro, Fan Fests (free public screenings by FIFA) and the Red Square. Yet, for a country that has a love-hate relationship with the English language, local authorities have done their best to make the city tourist-friendly. Moscow’s metro system now has directions in both English and the Cyrllic alphabet. English lessons were arranged for a host of locals who come into direct contact with the fans, like doctors, taxi drivers, metro workers and bartenders. With Russia at the receiving end of much criticism for the lack of law and order during sporting events, there was heightened security around the Russia Day celebrations two days before kick-off. The Russian Football Union (RFS) had also blacklisted scores of “ultras” and hooligans to prevent them from creating trouble during World Cup games, though some of them, reportedly, still got tickets. However, it would be a different matter altogether to cause trouble at the stadiums. A local fan in Moscow said that the Russians normally would not be afraid of causing trouble at World Cup games, but since the Federal Security Service (FSB) has been brought into the matter, they are scared out of their wits. About 1,300 cameras have been installed in the Luzhniki Stadium alone. Even the slightest act of trouble could be picked up and, this, said the fan, would be noted by the FSB, who would take strict action and bring the persons in for interrogation. Horror stories of state-related abductions are common here. The 101st kilometre mark is a well-known term that came up during the 1980 Summer Olympics in Moscow. It is said that the Soviet government had pushed all “undesirable elements” like prostitutes, loiterers, dogs and alcoholics beyond the Moscow Oblast boundary which was 101km away from the city centre. There are whispers of something on the similar lines being carried out in the weeks leading up to the tournament, but owing to the growing number of human rights groups, it has not been as obvious or as large-scale in big cities like Moscow and Saint Petersburg as it was in 1980. Culling of dogs, though, has been widely reported and noticed, while there have been reports of 101st kilometre-type social cleansing in cities like Ekaterinburg, Nizhny Novgorod and Kazan. Spaces have been demarcated for budding musicians in metro stations to bring their instruments and entertain passersby, and also earn a little in the process. They shift seamlessly from an unrecognisable Russian folk song to Tom Petty’s ‘Free Fallin’ when they notice non-Russians passing by. 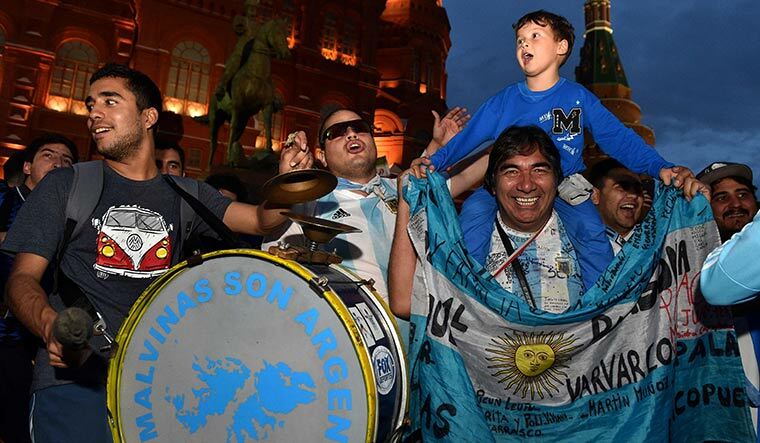 The FIFA Fan Fest had kicked off to a rousing start days ahead of the first match day. 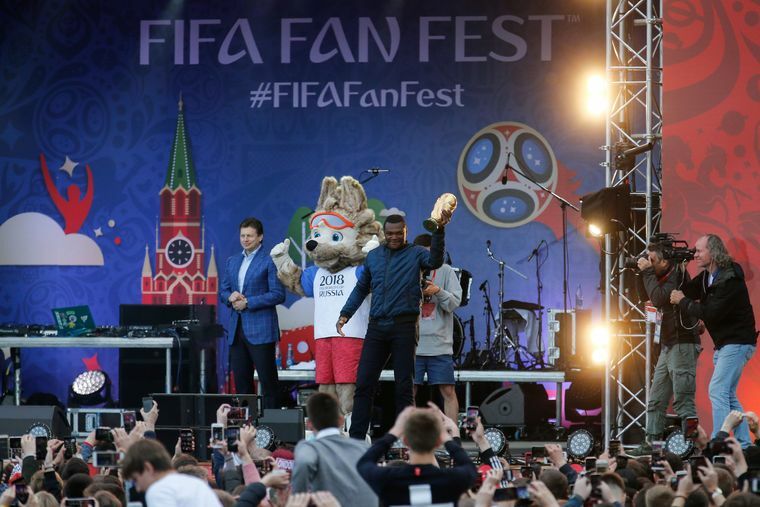 About 25,000 people are said to have attended the first day, which was declared open by retired footballers Marcel Desailly (France) and Aleksandr Kerzhakov (Russia). The Fan Fest in the capital is located next to the Lomonosov Moscow State University and the Moskva River, across which is the Luzhniki. Russian and international artistes entertained the crowd, creating a rock-concert like atmosphere. This will be a regular throughout the month of play. A variety of fan groups could be seen at the Red Square, chanting national songs, waving flags and interacting with each other. The Americans, who had bought the most number of tickets available to foreigners, (though their team did not qualify), were conspicuous in their absence. The Mexicans were always the largest group, but it was one of the smaller ones—the Egyptians—who attracted the most attention. All thanks to one man and his meteoric rise—Mohamed Salah. Salah arrived in Grozhny, Chechenya, with the Egypt team on June 10, still nursing a shoulder injury. As soon as he stepped out, he was pounced on by an Egyptian fan who wanted a selfie. The fan grabbed hold of Salah’s injured shoulder and the player winced. Security pulled the fan away while the Egyptian talisman was rushed into a facility to ease the pain. No team in this World Cup is as reliant on one player as Egypt is on Mo Salah. Apart from Egypt, Peru had the most enthusiastic fans around. It is interesting to note that these two countries have been away from the World Cup the longest among the teams who qualified this time. Peru has been waiting for 36 years to get back to football’s biggest stage, while Egypt has not qualified since 1990. And so the teams flew in, some in their eye-grabbing attire (Nigeria) and others in Rolling Stones-themed aeroplanes (Argentina). But politics reared its ugly head as Nike pulled out of supplying boots to the Iranian team because of the economic sanctions against the country. It created a lot of confusion in the Iran camp, days ahead of their first game, and left coach Carlos Queiroz fuming. The sanctions had also affected the team’s logistics coming into the event, and even a warm-up game against Greece was called off for the same reason. The host country’s chances do not look the brightest going into the tournament. Local fans had all but given up hopes of Russia, the lowest ranked team in the tournament (70), going past the group stages even before the tournament began. The team had not won a game in eight months and ended their warm-up games with a 1-1 draw against Turkey. Yet, coach Stanislav Cherchesov told the media that Russia would outdo their group stage opponents. “You will see the ideal Russian team,” he said. The team trained in Novogorsk, a town just outside Moscow, and were in full strength, though injuries had hampered the preparation of the hosts long before the tournament started. Forward Aleksandr Kokorin and young defenders like Viktor Vasin and Georgy Dzhikiya had to be excluded from the final squad because of injury. Cherchesov will look to his team’s backbone—goalkeeper Igor Akinfeev, midfielders Alan Dzagoev and Aleksandr Golovin, and striker Fedor Smolov—to steady the ship. Doubts were raised over the rationale of continuing with Cherchesov as coach, as he oversaw the longest winless streak since the Russian team was formed. The front page of one Russian daily had the headline “Everything is bad” in one of the days leading up to the start of the World Cup. Cherchesov has been blamed for the lack of consistency in his tactics and use of players. When Russia face teams like Egypt or Uruguay in the group stage, it would only take one Mo Salah or Luis Suarez to destroy an underprepared team. British popstar Robbie Williams was roped in to headline the opening ceremony along with former Brazilian striker Ronaldo. This was seen as a move to counter the poor response to the official theme song—“Live it Up” by Will Smith and Nicky Jam. There were concerns that rains would affect the opening ceremony, but they surely will not affect the games or the spirit of the travelling fans. The sun rises as early as 3:30am and sets not before 9pm, and the long days have given tourists from warmer climes more time to spend outdoors. From Red Square to Luzhniki, via the metro, Moscow is already splashed with colours from the flags of numerous nations, making up for the relative disinterest among the locals.